For Minneapolis St. Paul metro area homeowners, garages, storage structures and other outbuildings are often neglected and ignored. That’s unfortunate, because they need all of the same maintenance and repair services required by homes. In addition, those outbuildings, whether attached to the main house or freestanding, tend to accumulate clutter, unused possessions, and other items. 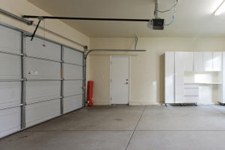 In some cases, garages are so filled with clutter that some homeowners can’t even park a car in them. Garage Door Service – Is your automatic garage door opener making noises or not working properly? Is your garage door unsightly or damaged? Just call our complete handyman service. Our garage door specialists can repair your garage door to operate like new, paint your garage door, or completely replace your old garage door and opener with a new one. You’ll be surprised at how little it costs, and the difference it can make in your daily life is remarkable. General Repair & Maintenance – All of the handyman and maintenance services our full-service home handyman company performs for homes also apply to garages and outbuildings. From electrical and painting services, to structural and cosmetic repairs, our customers rely on the fast, affordable services of our team of home repair and maintenance experts. Garage Interior Finishing – If your garage interior has open stud walls and no insulation, the construction specialists at our complete handyman service can insulate those walls and install and paint drywall to provide a finished appearance. At the same time, we can add electrical outlets and other conveniences to make your garage even more useful and comfortable. Storage System Installation – De-clutter your garage and move your valuable possessions off the floor and into shelving, tool storage organizers, and other storage installations. The result is more available space and better organization. You may even be surprised at the forgotten treasures you discover. Let our professional Twin Cities handymen get the job done quickly and inexpensively. Outbuilding Installation & Construction – There’s a wide range of pre-fabricated outbuildings available from home supply stores and other sources. Assembling and installing them, though, is a challenge for most homeowners. Rely on the experienced team at our full-service handyman company to do the job for you quickly and properly, at a low cost. De-Cluttering and Junk Removal – If unused and unwanted items have piled up in your garage or other storage areas, making it all but impossible to use them for their intended purpose, call our complete handyman service in the Minneapolis St. Paul area and we’ll help you get rid of that accumulated junk. Let us do the hard work and properly recycle or dispose of your clutter. At HandyQuick, we’re standing by to help you with a full range of tasks around your property. We know that garages and outbuildings are often in need of attention and that you don’t have the time or expertise needed to take care of those problems. One call to us will bring hard working, efficient and experienced members of our team to your home to handle whatever work you need. Our services are very affordable, our performance is outstanding, and our skilled team is at your service. Call us today and let us help you get the most from your home and property.